WinDriver™ PCI for Linux automates and simplifies the development of user-mode Linux device drivers with Kernel mode performance for PCI / PCI-Express / CardBus / PMC / PCI-X / PCIe / PCI-104 and CompactPCI. No OS internals knowledge or kernel level programming required. x86 32-bit, x86 64-bit (x86_64: AMD64). Any 32-bit or 64-bit development environment (depending on your target platform) supporting C.
Friendly DriverWizard allows hardware diagnostics without writing a single line of code. Automatically generates the driver code for the project in C.
Supports any USB device, regardless of manufacturer. Enhanced support for specific chipsets frees the developer of the need to study the hardware’s specification. Applications are source code compatible across all supported operating systems —Windows 8/7/Vista/Server 2008/Server 2003/XP, Windows CE (a.k.a. Windows Embedded Compact) 4.x–7.x (including Windows Mobile), and Linux. Can be used with common development environments. No system-level programming knowledge required. Comprehensive documentation and help files. Two months of free technical support. No run-time fees or royalties. Fast: Shorten driver development cycle and time to market. Simple: No OS internals or kernel knowledge required. Stable: Field tested on thousands of HW / OS configurations. Enhanced Chipset Support: Silicon partners libraries to jump-start your driver development. Special samples for various PCI / USB chip vendors, such as PLX,Altera, Cypress, Silicon Laboratories, STMicroelectronics, Texas Instruments andXilinx. WinDriver generates a skeletal driver code, customized for the user’s hardware. Multiple OS support and cross platform: WinDriver product line supportsWindows 8 / Windows 7 / Vista / Server 2008 / Server 2003 / XP / XP Embedded,Windows CE / Mobile, Linux . The same driver will run under all supported operating systems without any code modifications. Just recompile! Immediate Hardware Access and Debugging: Test your hardware through a graphical user-mode application, without having to write a single line of code. 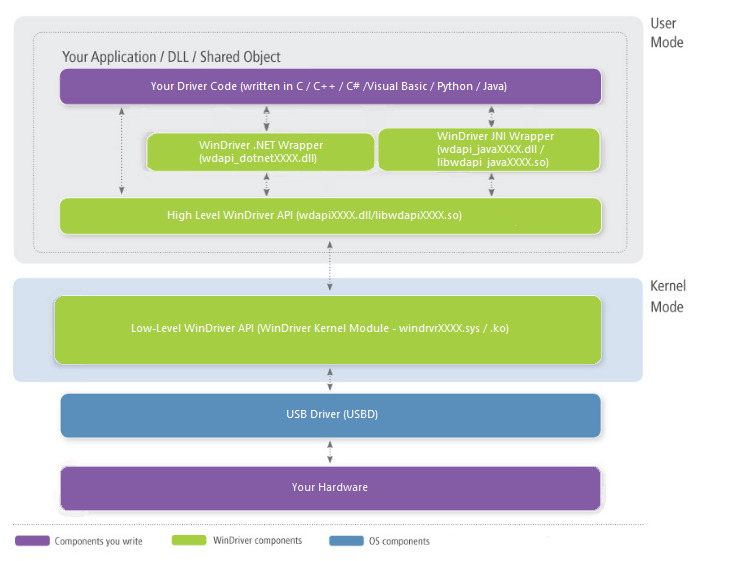 Monitor kernel level activity throughout the driver development process. 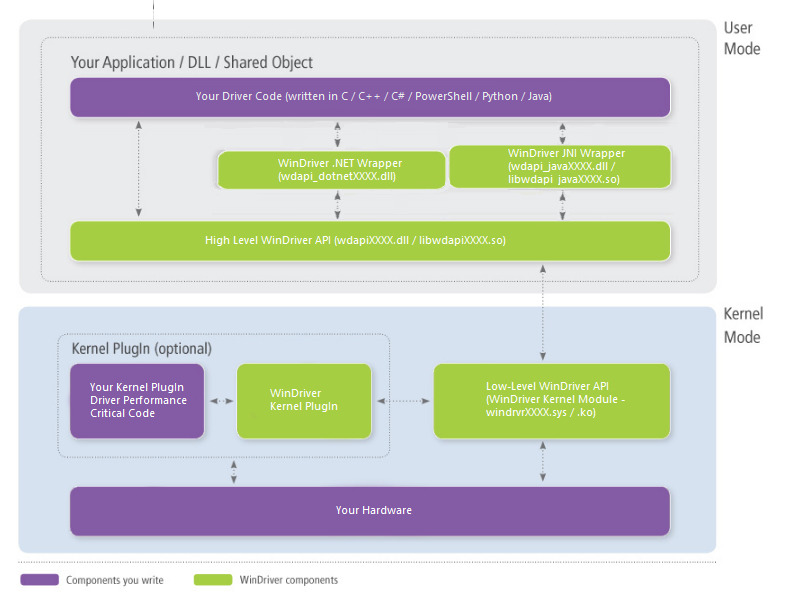 Performance Optimization: Use WinDriver’s Kernel PlugIn technology to develop your driver in the user-mode – then run performance critical sections of it in the Kernel Mode (Ring 0) to achieve optimal performance (more). WHQL Certifiable Driver: WinDriver’s Windows drivers are WHQL ready – you will not need to invest time and efforts on making your driver WHQL compliant. Jungo also can prepare the WHQL submission package for you. Field-proven quality: WinDriver’s technology enables you to concentrate on your core business and successfully create first-rate drivers without having to invest redundant resources in driver development from scratch. User-mode programming: WinDriver’s architecture enables driver development in the user mode, while maintaining kernel-mode performance. 64-bit Support: Allow utilizing the additional bandwidth provided by 64-bit hardware and enable 64-bit data transfer on x86 platforms running 32-bit operating systems. Drivers developed with WinDriver will attain significantly better performance results than drivers written with the DDK or other driver development tools that do not support this feature. Complete .NET Framework Support: Easily incorporate WinDriver’s C# or VB.NET code into your existing .NET application using the powerful object oriented managed extensions for C++ library. WinDriver products are accompanied with highly detailed technical references that are designed to assist you in various stages of the development process. If you have just started evaluating or using WinDriver, you may find our Quick Start Guideshelpful. Should you require more in-depth information, or would like to know more about the technical aspects of WinDriver, please refer to our Online Manual. For other technical resources, such as FAQs and technical documents — see WinDriver’s Support Page.